This hat is much prettier than this scan makes it look! I am the only one that has made this hat so please let me know if you have any questions. Gauge: 4 & 1/2 stitches per inch. ends inside the cherry. No stuffing needed. 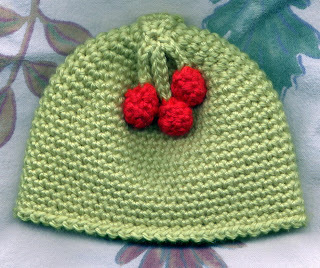 Cherries: With Red yarn, chain 2. Round 1: 4 single crochet in second chain from hook. Round 3: Single crochet 1 round even. Round 4 Single crochet 2 stitches together around. yarn end in and out through one loop of each stitch. Pull tight and hide end inside cherry. Leaf: With green yarn, Chain 2. Row 6: Single crochet 2 together. Cut yarn leaving a long enough end to sew leaf to top of hat. This hat was 12 inches around. It was for a petite baby. until you get the size you want. Round 1: 6 single crochet in second chain from hook. single crochet around until desired length. I crocheted 15 more rounds even before the trim. around, ending with; chain 1 and join in first slip stitch.